Searching for a job requires the perfect résumé or CV, and there are countless online guides dedicated to CV-crafting that promise to get you to the second round of the hiring process. But if there’s one thing you’d never do, it’s list your failures on there, right? Well, that’s exactly what one esteemed Princeton University professor has done, and a growing number of researchers say it’s something we should all be a little more open to. 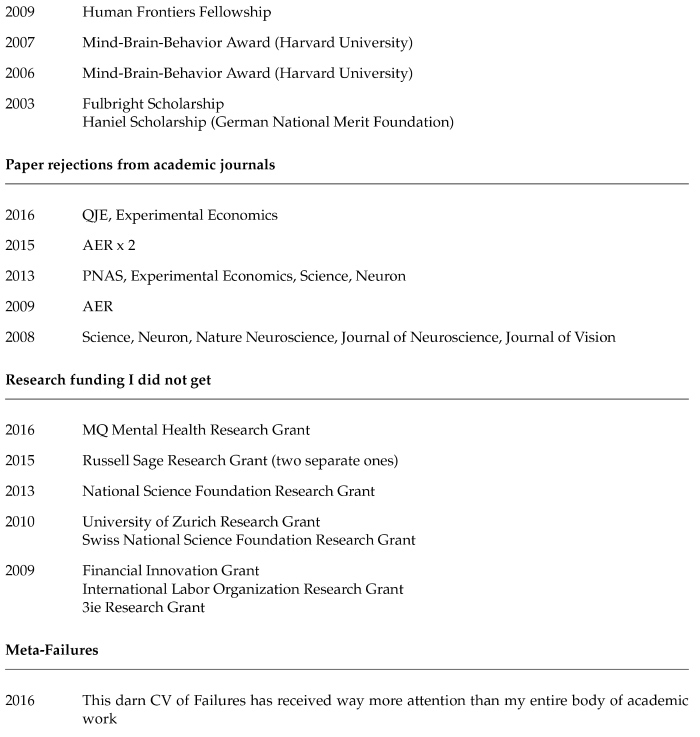 Professor of psychology and public affairs Johannes Haushofer wrote his ‘CV of Failures’ a few years ago for his students, but in April 2016 decided to put the document online in the hopes of making a broader audience realise that we all experience failure on the way to success. To everyone’s surprise, the résumé went viral. The document (which you can see below), stretches back to the late-1990s, and details every single academic rejection letter, failed scholarship application, unaccepted degree program and turned-down job position that he’s had to deal with to get to where he is now. It might sound strange for someone’s failures to get more attention than their successes, but there’s actually a scientific reason the CV has become so popular. For starters, while we all know about our own failures, and maybe those of our close friends and family, it’s often difficult to imagine that the people we admire professionally have experienced something similar. This is a myth Haushofer is trying to break down. “Most of what I try fails, but these failures are often invisible while the successes are visible,” Haushofer told The Washington Post last year. Haushofer isn’t the only academic with this opinion. He originally decided to write his CV of failures back in 2010 based on a paper that Melanie Stefan from the University of Edinburgh published in Nature claiming the same thing: that CVs of failure may help you realise that failing is just part of life and isn’t shameful. “My CV does not reflect the bulk of my academic efforts – it does not mention the exams I failed, my unsuccessful PhD or fellowship applications, or the papers never accepted for publication. At conferences, I talk about the one project that worked, not about the many that failed,” Stefan wrote at the time. But not only does recognising other people’s failures break down the shame surrounding our own missed opportunities, it can also inspire us to work harder. Earlier this year, a team of researchers from Columbia University took more than 400 students and broke them into three groups: one was given an 800-word description if the great accomplishments of Albert Einstein, Marie Curie, and electrochemist Michael Faraday; another was told about the scientists’ personal struggles; a third was taught about their intellectual failures and experiments gone wrong. Students in the second and third groups, who learnt about their scientific heroes’ failures, ended up getting better grades than those who only heard about their successes. To be clear, no one is recommending that you list your failures on your CV next time you apply for a job – Haushofer only created his CV of failures for personal use and to inspire others. But a growing body of research suggests that we might all benefit from being a little more open about our failures with others, and realising that even our academic idols aren’t perfect can be a big help when it comes to getting through our own careers. A version of this story was originally published in April 2016.